Boston Pride is pleased to announce that Governor Deval Patrick has been selected as a Grand Marshal of the 2014 Pride Parade by the Board of Directors of Boston Pride. 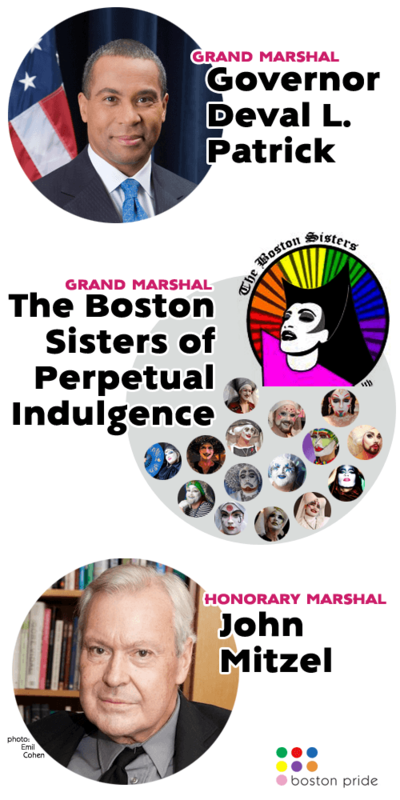 The Sisters of Perpetual Indulgence were named as Grand Marshal and John Mitzel was named as Honorary Marshal through an online community vote. The Boston Pride Parade is a march to celebrate and promote equal rights for the region’s gay, lesbian, bisexual and transgender communities and is the premier event of Pride Week. As one of the most popular Pride Parades in the country, organizations and individuals from around New England and beyond will walk together to advocate for inclusivity, equality and respect. 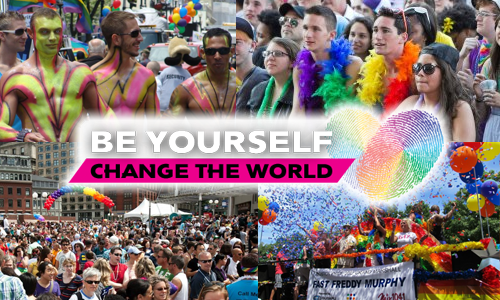 The theme of the Boston Pride Parade this year is “Be Yourself, Change the World,” and encourages the LGBT community to embrace what makes each individual unique and to use those qualities to change the world for the better. Governor Patrick has been a strong voice for LGBT rights in the Massachusetts State House as a staunch supporter of Marriage Equality. In addition, under Governor Patrick, Massachusetts became the 16th state to recognize transgender citizens as a protected class. In 2011, Governor Patrick signed into law, “An Act Relative to Gender Identity,” which legally protected transgender individuals from discrimination and hate crimes. Governor Patrick has also made it part his mission in office to improve the lives of LGBT youth with his swearing in of new leadership to the Massachusetts Commission on Lesbian, Gay, Bisexual and Transgender Youth. He continues to fight for equal rights for all. The Sisters of Perpetual Indulgence is a charity and street performance organization that raises money for AIDS and LBGT causes. They devote themselves to community service, ministry, and promotion of human rights. Through humor and fun, the Sisters fight the forces of bigotry and uphold spiritual enlightenment. Boston Pride is also honoring John Mitzel as an Honorary Marshal, which is given posthumously. John Mitzel is a Boston gay icon, owning one of the country’s first LGBT bookstores, Boston’s Calamus Bookstore. He also wrote several books, including fiction, poetry and nonfiction. Mitzel was an active participant in shaping the City’s queer cultural identity and helped organize the first Gay Pride March in Boston. He passed away on October 4, 2013. Boston Pride Week 2014 will be held from June 6th through June 15th. This year’s theme is “Be Yourself, Change the World.” The week will kick off with the annual Flag Raising ceremony, and will also include, Pride Day @ Faneuil Hall, Pride Queeraoke, Pride Night at Fenway Park, the Boston Pride Parade, the Boston Pride Festival, the Pride Youth Dance, the Back Bay Block Party and the JP Block Party. More information and details for Boston Pride’s 2014 Pride Week can be found at www.bostonpride.org. For real time news and exclusive updates download the app for your iPhone or Android today! Like us on Facebook and follow us on Twitter @BostonPride and #BostonPride.